Cheap Predictions: Pick Survivor Series results and win! Vidjagame Apocalypse 43 – Happy Thanksgivukkah! YES. I have been waiting for this episode. Possibly, it is the thing I have been waiting for all my life. I’ll be sure to think of him when I eat my beefy charboiled hamburger and french fried potatoes. Listening to this podcast has been one of the weirdest experiences of my life. I am from Minnesota and my aunt worked for best brains many years. Her name was even brought up during the podcast. Whenever I hear you guys talk about MST3k I remember the really cool experience of taking a tour of the studio as a young boy. I didn’t really understand how it cool it was until a couple years ago when I became old enough to enjoy the humor. My dad even hoards some of the original copies of the show on VHS he was given after the studio closed. I will try to get some pictures of them next time I go home. However, this show has always been darkened for me by how mean my aunt is to me for seemly no reason. This week being the peak of the is as I was uninvited from thanksgiving this year at her house(I can’t make this up). This is downloading really slowly for some reason. Like 56k speed. Yay, something to listen to on my flight home for turkey day!!! Potatoes are what we eat! I have no idea what this is but ill listen. Holy mother of god, it finally happened. My favorite podcast discussing my favorite TV show of all time. Can’t wait to listen to this tomorrow at work. Think I’ll have my own pre-Turkey Day MST3K marathon in the meantime. Love you guys! fantastic. I just watched the Gamera episode the other week. really took me back. think I’ll have to hunt these down through completely legal means. living in Canada I only caught this show at my grandparents place, because they had a satellite dish. when the movie came out on VHS I watched that thing like 30 times. I will never forget the summer of 95 when my friends and I would stay up reading comics and issues of Wizard magazine so we could watch MST3K from 1:15 am to 3:30 on TV. Hearing that ending theme ALWAYS sends a wave of nostalgic chills through my body. I will never forget this show and the impact it had on my humor and love for awful “good” movies. 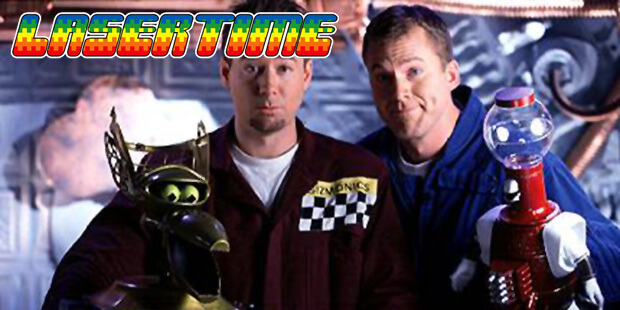 Finally, Lasertime and MST3K meet. I’ve been waiting for this for so, so long. As a side-note: I’m from the Netherlands, so I only got to learn about MST3K because of the internet around the time YouTube started becoming big. Too many channels tried to do the whole audio-commentary on top of bad videos thing, and through that I learned about how this was based on some old American TV show because it was always refered to as “MST3King”. It’s only about a year ago or so that I decided that I’d actually sit down and see what all this MST3K stuff was really about. I’ve since seen all of it, minus the movie. And some Rifftrax, still looking into the whole Cinematic Titanic thing. Gotta be honest, I’ve never found them funny. I’ve tried and wanted to because so many people I love love them but I guess its just not my bag. Listening to this episode made me feel like a non-Simpsons fan listening to the Simpsons episode. I’ve tried MST3K before and simply couldn’t get into it, so for me this episode was a bit of a dud. Watching the turkey day live stream at the moment and figure I’d share how I came upon MST3K. Turkey day 92. I was over my grandparents place and all my older cousins were gathered around the TV watching Teenagers from Outer Space. It only took me a few minutes to become completely enamored. Since that day I’ve been a huge MST3K fan. I knew in my heart you guys would do an episode dedicated to MST3K eventually. This was perfect timing. MST3k completes my life. My cable company had a weird thing in the 90s where Comedy Central shared a channel with VH1 so alot of times I missed episodes. But my first one (and still my favorite) was The Pod People. Other notables are Cave Dwellers and Time of the Apes. My family and I still have a closet full of MST3K tapes. I should probably bust those out the next time I come up. I distinctly remember being torn Saturday mornings on weather I was going to watch wb, sci fi anime hour or mst3k. Lasertime has become an important show for me. I am 32 and all of my friends/family/coworkers know nothing of things like mst3k, Simpsons , video games, inane 80 s movie trivia etc… The show has been validation for my entire life, filling the void of desolation in my soul. Thank you! Just finished the turkey day marathon, man doesn’t that outro song make you sad? So this episode got me to watch MST3K for the first time and I’m ashamed I haven’t started sooner. I have watched Blood Waters of Dr.Z and Final Sacrifice, and really enjoyed them. LOVED this episode! MST3K dominated my friends and my lives throughout highschool and college; so great to enjoy it through LaserTime. I gotta say, Pod People has always been my favorite. Pop group goes camping, happens upon an odd family who happens upon a newly hatched alien who’s mother is on a killing spree, so great! It has definitely been by far our most quoted episode. I’d love to see a Part 2 for this! What a great episode. It brought back a lot of great memories. The greatest thing to come out of the Midwest since The Packers. Packers. Packers? PAAACCKKEERRS! PACKERS WON THE SUPER BOWL PAAAACCCKKKERRRS!. Movie Review: Straight Outta Compton!